Please note that this clutch kit fits. Without any issues, for the rest of the models you must use our. Flywheel as a conversion kit and Hondata flash pro on the models that require it. 5 Speed Trans must use kit/flywheel Together. Must use Kit and Flywheel together. 09-14 must use kit and flywheel together/must. 5 peed Trans must use Kit and Flywheel together. Must have Hondata Flash Pro. MUST USE OUR ACR FLYWHEEL FOR RSX/CIVIC SI Base Model, TSX, Accord, 2012+ Civic SI. However, once the package gets picked up from our location, we have NO control on how long the carrier takes to deliver the item, at times the terminals can be congested and take up 1-2 day delays. Q: WHAT COMPONENTS ARE INCLUDED WITH AN ACTION CLUTCH KIT? 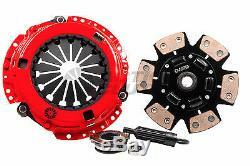 A: Action Clutch kits come complete with all components necessary to install the clutch. Components include pressure plate, clutch disk, throwout bearing, and alignment tool. High quality Japanese pilot bearings are also included in applications that call for such component. Q: IS FLYWHEEL RESURFACING NECESSARY BEFORE INSTALLING A NEW CLUTCH? A: A smooth, flat flywheel surface is essential for proper clutch operation. Flywheels are subject to heat, scoring, and warping during use. We highy recommend that the flywheel be resurfaced by a reputable automotive machine shop whenever a clutch kit is installed. Resurfacing should be done on a flywheel-grinding machine only. If your flywheel shows any signs of cracking, replace it. Never roughen the flywheel clutch surface wih sanding as this reduces clutch life. The surfaces are designed to rub against each other (producing friction), not tear into each other. Q: DO ACTION CLUTCHES REQUIRE A BREAK IN PERIOD. A: Yes, all Action Clutches must undergo a break in process of moderate stop and go driving. We recommend a break in period of 250 miles for organic, 500 for pucked discs and 1000 miles for Kevlar discs. Q: WILL AN ACTION CLUTCH INCREASE PEDAL EFFORT? A: Action pressure plates are specifically designed to handle high torque applications. With increased clamping force and torque capacity, comes increased pedal pressure. The "1 Series" single diaphragm pressure plates increase pedal pressure vs. Q: CAN AN ACTION CLUTCH PUCK STYLE DISC BE USED FOR DAILY DRIVING? A: Puck style discs are very aggressive and offer a no nonsense performance action. The engagement of a puck style disc will be much more adbrupt and longevity of the disc is considerably less than a full face disc. The puck style discs are intended for racing applications, but can also be used on street driven vehicles. As a customer you must decide on the trade off between daily driven comfort and performance gains. ACR CHROMOLY LIGHTWEIGHT FLYWHEEL 11LBS K SERIES. ACTION Lightweight Flywheels have three major benefits: low weight, low inertia and high thermal capacity. They are specifically made for light to high tuned racing cars that see drag racing, autocross, street use, and rally events. They are made from a durable one-piece billet chromoly steel or chromoly steel forgings. Action specifically designed this flywheel for reduce in weight and inertia for better engine response. We have tested our lightweight flywheels and they have passed engineering tests up to 15,000-18,000 RPM. They are made to not to fail to the provided RPM's. With a heat-treated friction are and integrated ring gear, Chromoly Flywheels are an excellent choice for any performance build. Chromoly is an abbreviation for chromium-molybdenum steel due to its property of incorporating alloy elements chromium and molybdenum. With the combination of materials, Chromoly has an outstanding strength to weight ratio and is stronger and harder than standard 1020 steel or other aluminum flywheels on the market. This Action Racing 11LBS Flywheel Fits The Following Vehicles. FAQ Q: WHAT COMPONENTS ARE INCLUDED WITH AN ACTION CLUTCH KIT? Components include pressure plate, clutch disk, throw-out bearing, and alignment tool. We highly recommend that the flywheel be resurfaced by a reputable automotive machine shop whenever a clutch kit is installed. Never roughen the flywheel clutch surface with sanding as this reduces clutch life. We recommend a break in period of 250 miles for organic, 500 for puck discs and 1000 miles for Kevlar discs. The "2 Series" dual diaphragm pressure plates increase pedal pressure vs. The engagement of a puck style disc will be much more aggressive and longevity of the disc is considerably less than a full face disc. The item "ACTION CLUTCH STAGE 3 KIT for HONDA CIVIC SI 6-SPEED ACURA RSX TYPE-S K20 USA" is in sale since Thursday, March 29, 2018. This item is in the category "eBay Motors\Parts & Accessories\Car & Truck Parts\Transmission & Drivetrain\Clutches & Parts". The seller is "goldrush-performance" and is located in West Covina, California.